Founded in 1998, HELLENIC PETROLEUM is one of the leading energy groups in South East Europe, with activities spanning across the energy value chain and presence in six countries. Its shares are primarily listed on the Athens Exchange (ATHEX: ELPE) with a secondary listing on the London Stock exchange (LSE: HLPD), while its two bond issues are listed on the Luxemburg Stock Exchange. In 2018, Group Adjusted EBITDA amounted to €730m, on total revenues of €9.8bn. HELLENIC PETROLEUM’s key shareholders are Paneuropean Oil and Industrial Holdings S.A. (45.5%) and the Hellenic Republic Asset Development Fund (35.5%), with the remaining held by institutional (11%) and private (8%) investors. Refining is the Group’s core business, accounting for 75% of total assets. It owns three of the four refineries in Greece, of total capacity of 340 kbpd, with a 65% share of the Greek wholesale oil products market. The Group is the domestic ground fuels marketing leader, with a retail network of c.1,700 service stations throughout Greece as well as LPG, industrial, aviation and marine fuels and lubricants businesses. 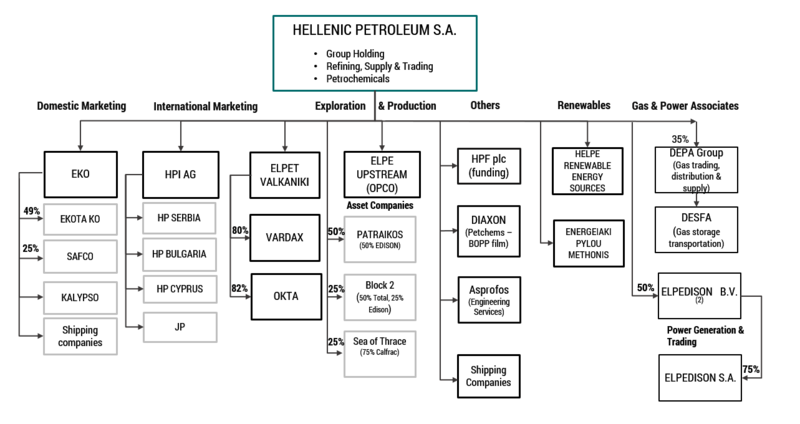 HELLENIC PETROLEUM is a leading player in SE European markets. The Group owns OKTA facilities in Skopje for transportation and marketing of petroleum products and through its network of over 300 petrol stations is one of the key fuels marketing players in Cyprus, Serbia, Bulgaria, Montenegro and N.Macedonia. The Group’s exploration and production activities are focused in Greece by developing an exploration portfolio in onshore and offshore areas, either independently or in collaboration with companies in the sector such as Total, ExxonMobil, Repsol and Edison. HELLENIC PETROLEUM is the sole petrochemicals producer in Greece, mainly active in the propylene- polypropylene value chain. Domestic market shares exceed 50%, while exports, mainly in Turkey and other Mediterranean countries account for c. 65% of sales. 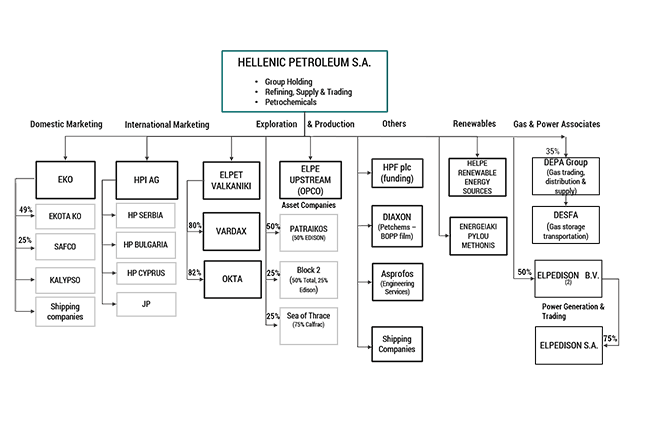 HELLENIC PETROLEUM is also active in the power and gas sectors. Power generation and trading activities are carried out through Elpedison, a JV with EDISON, which owns and operates two CCGT plants in Greece, one 390MW plant in Thessaloniki and a 420MW plant in Thisvi, with growing presence in the electricity supply business. Moreover, HELLENIC PETROLEUM entered the field of renewable energy sources with a portfolio of 26 MW in operation and over 300MW in various development stages. The Group is present in the natural gas sector through its 35% stake in DEPA, Greece’s incumbent gas company and the main natural gas importer and wholesale supplier in the country. DEPA and has a strong presence in the distribution and supply business through participations in local companies (EDAs and EPAs). The Group has disposed its 35% participation in DESFA for a cash consideration of €284m. on 20 December 2018. (1) All companies 100% owned unless otherwise noted. (2) 45% owned through HPI.